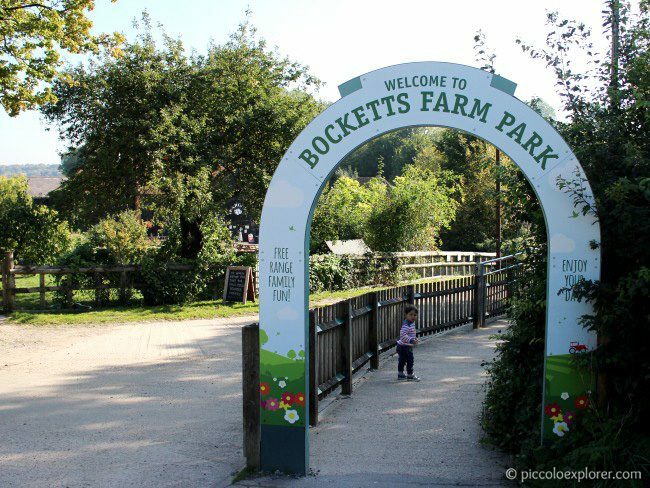 Earlier this month, we spent a lovely warm day visiting Bocketts Farm Park, a working free range farm in the beautiful countryside of Leatherhead, Surrey, only about a 45 minute drive for us from West London. 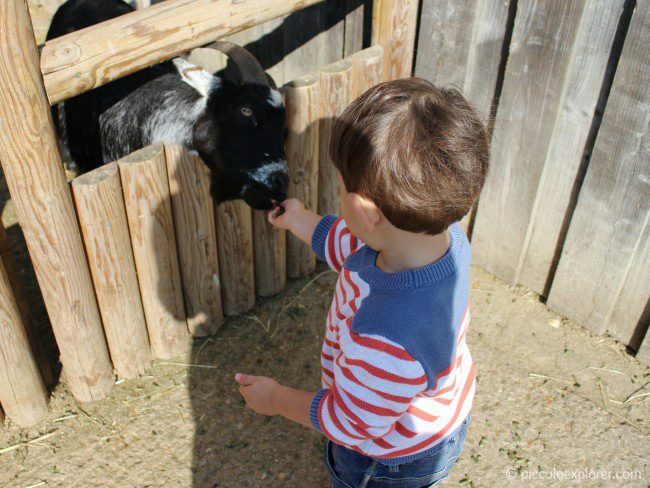 Animal (and bird) feeding was apparently the theme of that week as just the day before we were in Holland Park feeding peanuts to peacocks and seeds to squirrels (and we were back there again the day after with Mr G), and at Bocketts Farm Park, Little T was thrilled to be interacting with plenty of animals and feeding goats, sheep, cows and alpacas. 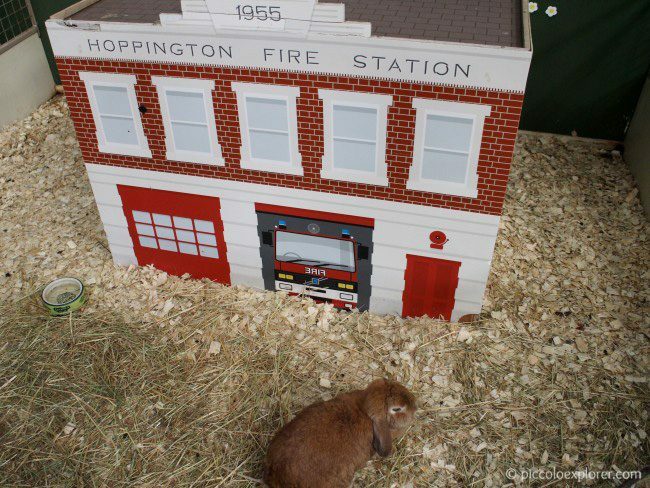 Once I’d paid for our tickets and a 90p bag of animal feed, and managed to coax Little T out of the indoor play area (which I’ll show more of later on), we headed to the “Little Hoppington” small animal village. 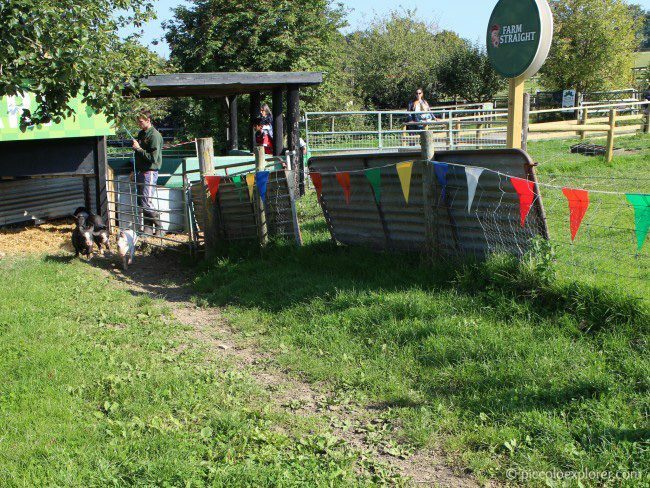 At several times during the day, the farm runs animal handling sessions here for little ones to interact with rabbits, guinea pigs and other small animals. We didn’t make it to a session but enjoyed walking around the village. There was an energetic chipmunk that was very entertaining to watch as he sped around his area, ran on a big wheel then went right back to jumping from one spot to another. I wish I took a video, or at least a photo! 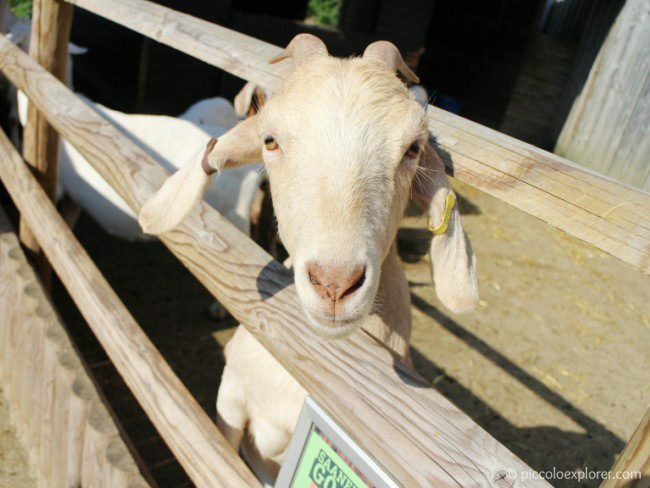 Right outside Little Hoppington are the milking goats, very friendly and happy to be fed. 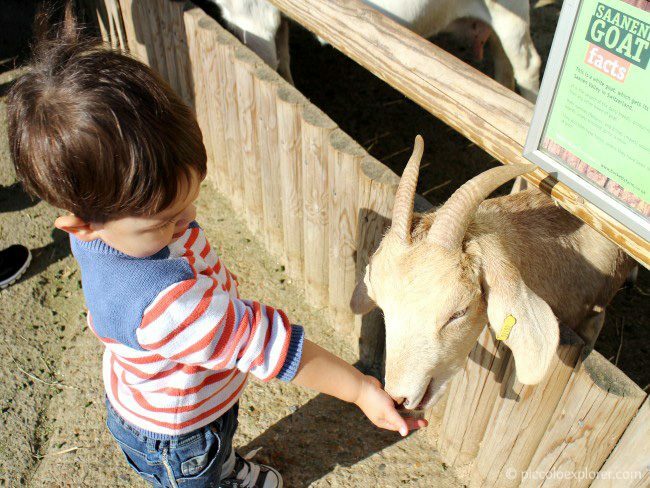 Little T loved the goats at the ZSL Whipsnade Zoo, so this was definitely a highlight for him to be feeding and petting them. After heading back in the barn by Little Hoppington to wash our hands, we made our way to another area to catch a tractor ride around the farm. 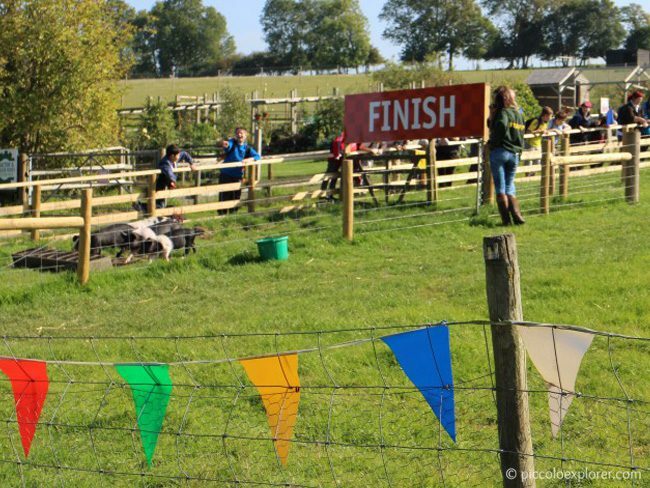 The staff at the entrance will let you know when the ride times are as they aren’t listed on the programme of events and change daily. On the day we visited, there was one at 12pm. 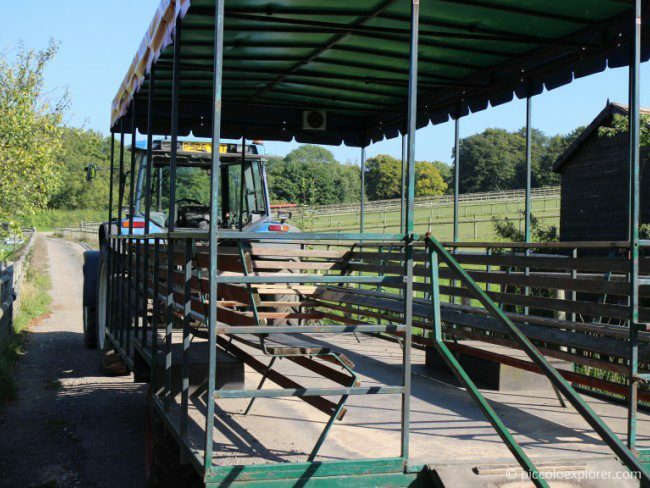 Tickets for the tractor ride cost £1.25 for adults and children 2 years and above. 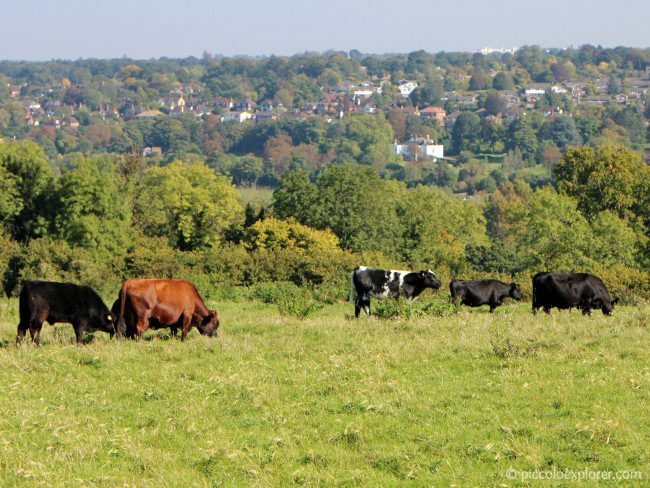 And views of the animals grazing in the fields. 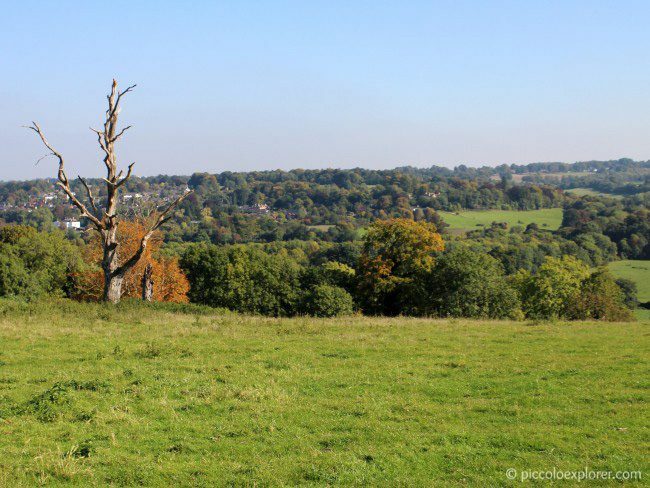 The weather was relatively mild that day, so we only had a little bit of wind, but the driver did mention that on some days it can get very windy at the top of the hill. 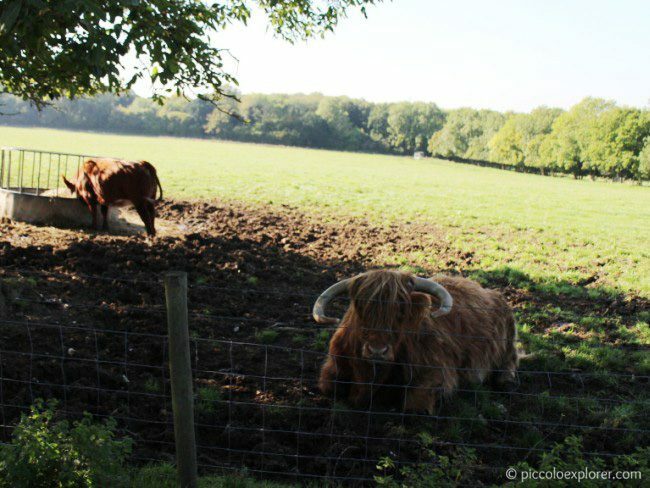 You can also walk around the farm on the Farm Park Walk to watch these animals out on the fields. 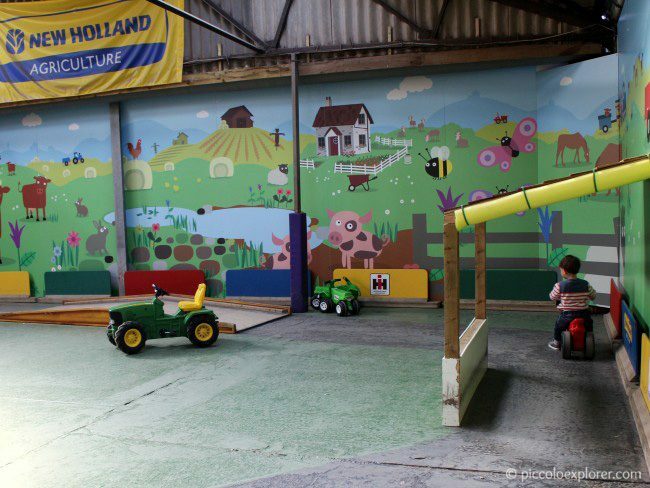 After the tractor ride, we went back to the main indoor area, where you’ll also find the Cow Shed Coffee Bar behind the red tractor. On the other side of the trampolines are the restrooms. 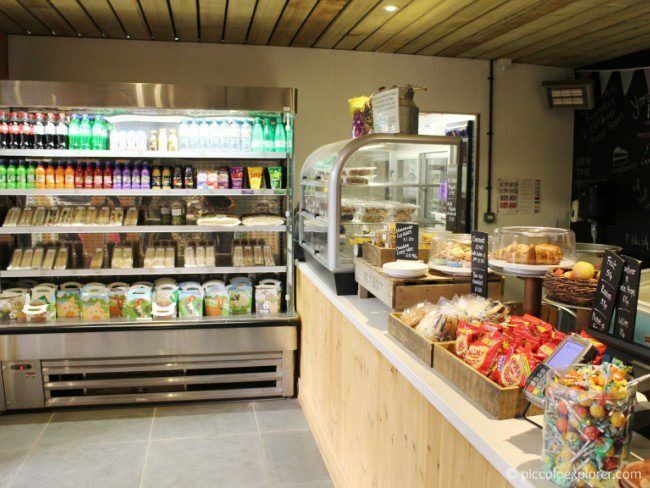 The Cow Shed Coffee Bar sells a wide range of hot and cold drinks, pastries and cakes, sandwiches and treats. 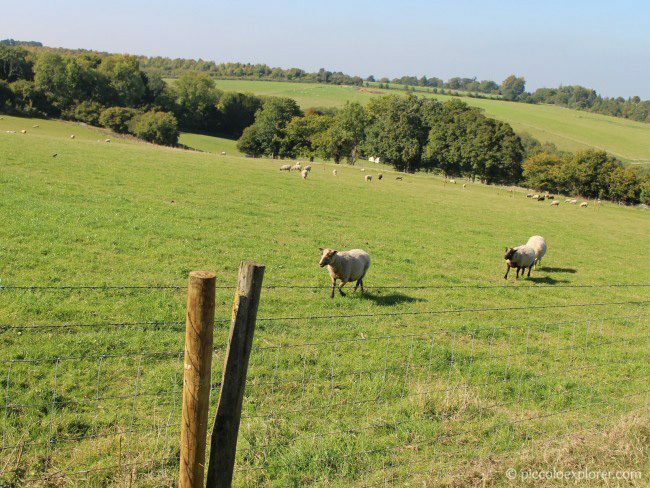 You can purchase a children’s picnic box for £3.70 which includes an apple or orange juice, sandwich (on brown or white, with ham, cheese, tuno mayo or jam), crisps, chocolate bar and an apple or raisins. 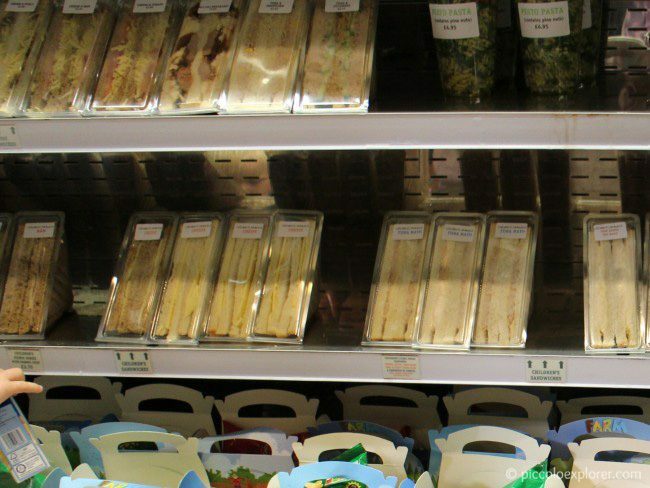 The sandwich is £1.90 on its own and the picnic box on its own (without sandwich) is £2.35. I already packed some fruit and snacks for Little T, so I ended up buying a ham sandwich for him, and a pesto pasta (which was delicious) for us to share. After lunch, Little T had a blast at the Bocketts Young Drivers area. 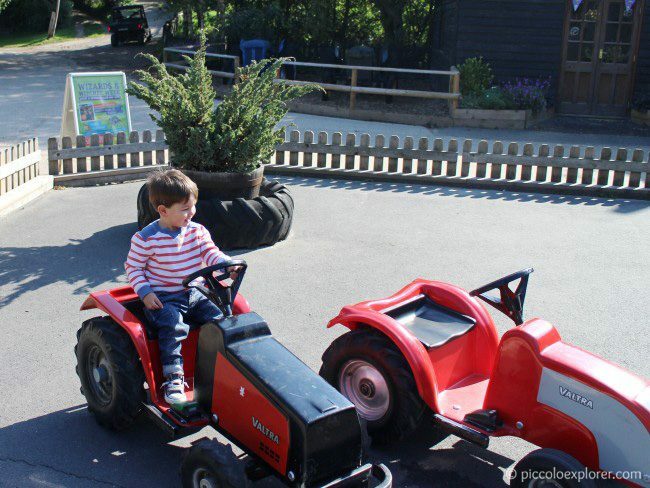 He loves ride-on toys and could have been there all afternoon, doing laps around the track, going through the tunnel and parking the tractor or bike into the little garages. 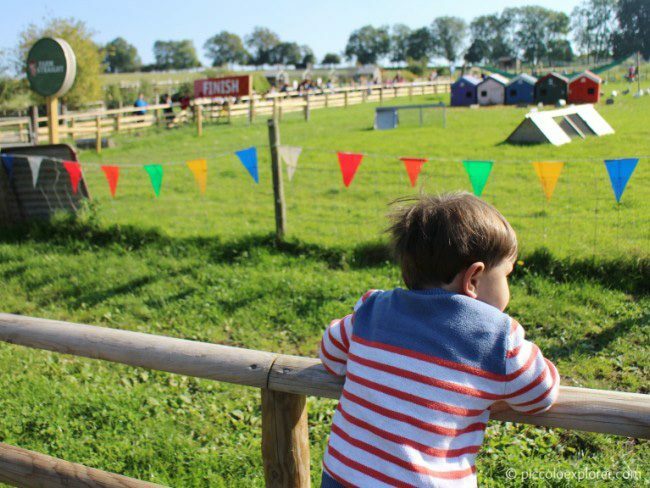 It was tough to get Little T to leave but he was excited to see the set up outside for the first pig race of the day; the races are held at 12.45pm and 3.45pm on weekdays. 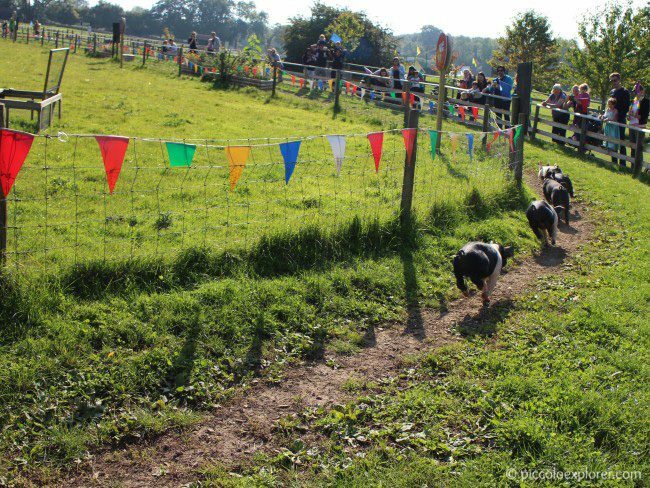 After flags were handed out in support of each pig, a gate was opened and the pigs were off! We were amazed at how quickly they sped past us, although there was an incline where they slowed down a little bit, they were all very quick to get to the finish line! 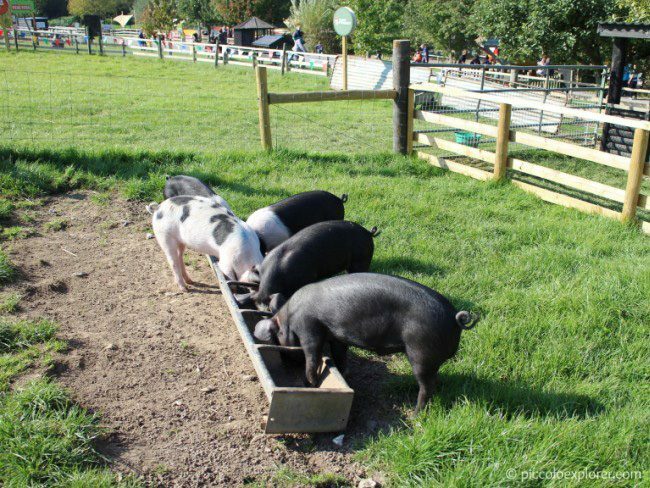 We went over to watch them enjoy their celebratory grub before heading to the Big Animal Barn to feed some animals ourselves. 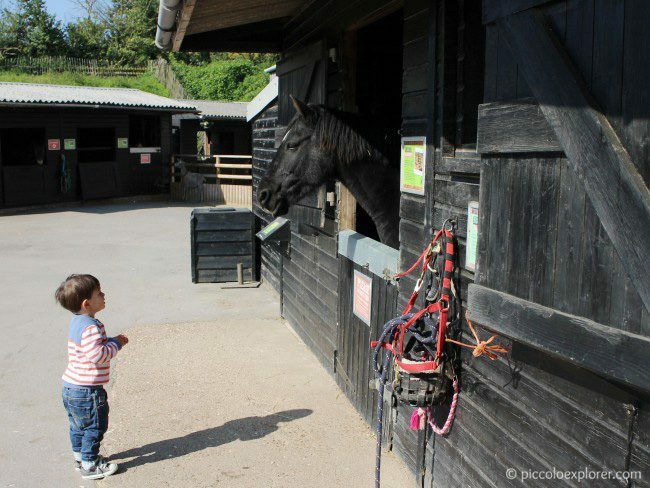 First, a stop at the stables to see the horses, ponies and a donkey. 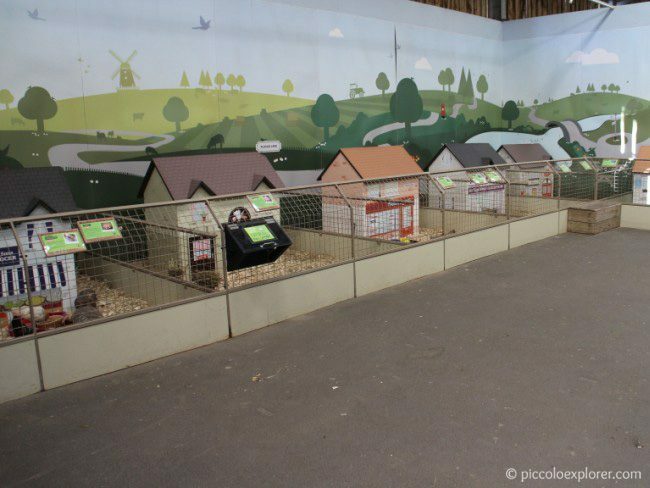 And then we entered the Big Animal Barn, where we were met with eager faces eyeing our bag of animal feed. 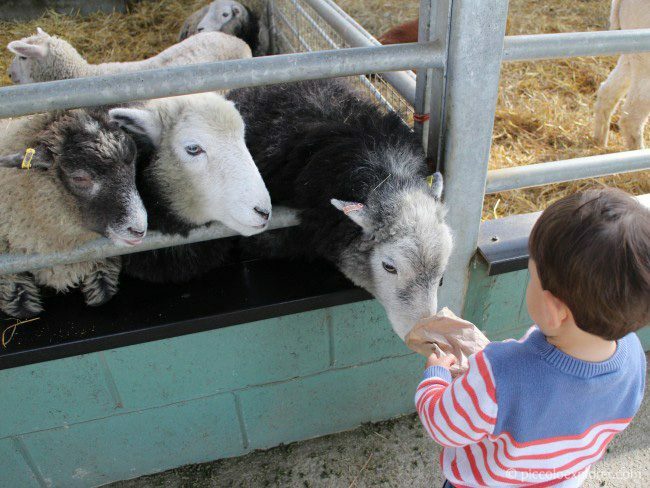 Little T went straight for the sheep who were poking their heads out for some snacks. At one point, Little T was giving them the food straight from the bag. I wish I bought another bag as the food went away pretty quickly – two bags would have been just right especially since quite a bit ends up on the floor. 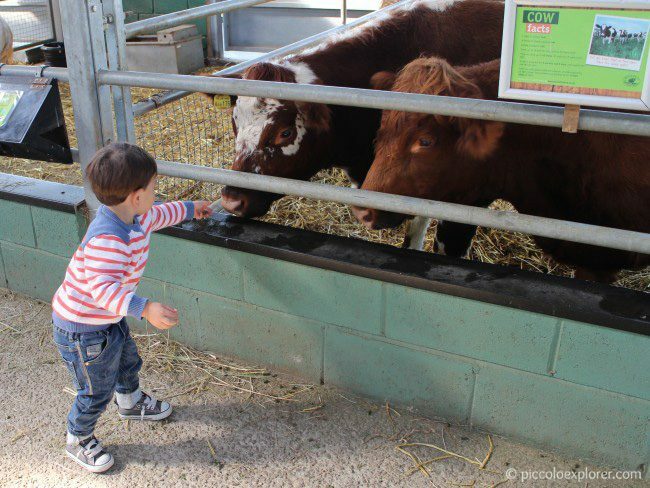 Little T kept going back to the cows but was a bit wary about feeding them by hand and would drop the little pellets for the cows to lick away with their long tongues. 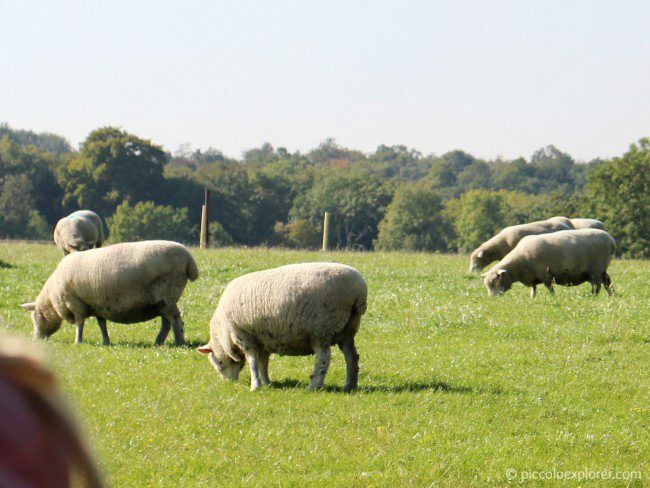 He was amazed by them and went back to wave good-bye when we were on our way out. 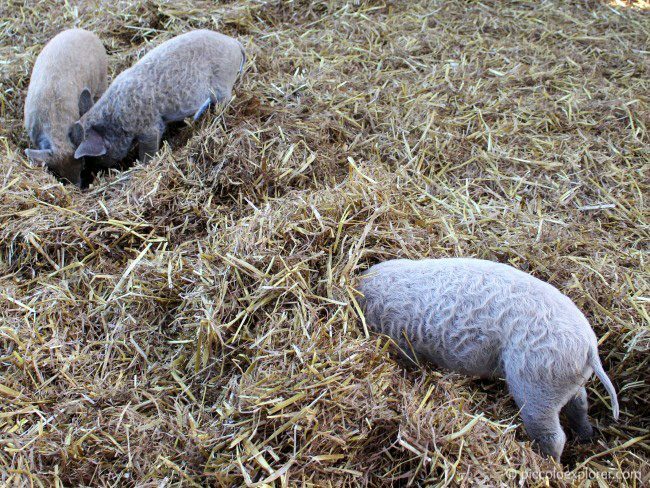 There were a few adorable piglets digging around in the hay of their pen. 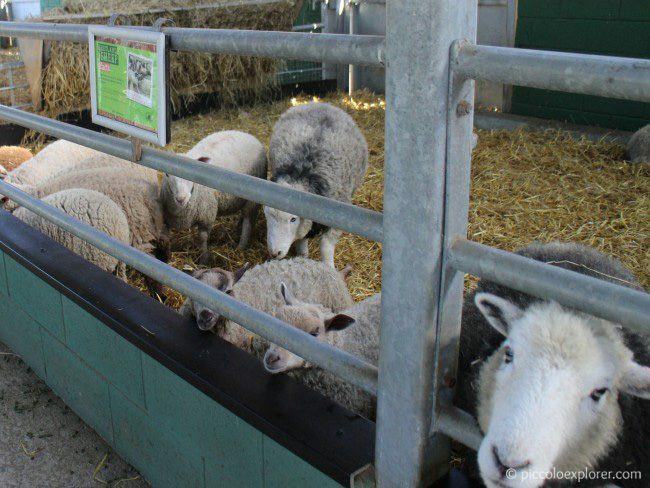 The pigs (and horses and donkeys) cannot be fed with the animal feed we purchased – there is plenty of signage around the farm so do double check which animals can be given the feed. 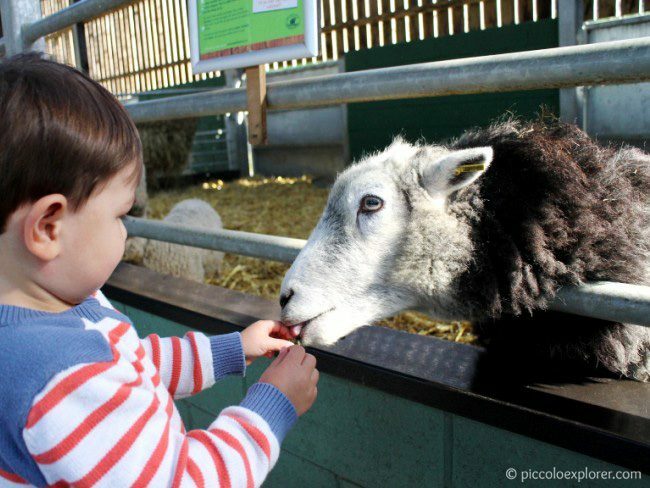 Overall, we had a great time at Bocketts Farm Park and there are plenty of activities going on at the farm to keep your little one(s) entertained at any time of the year. 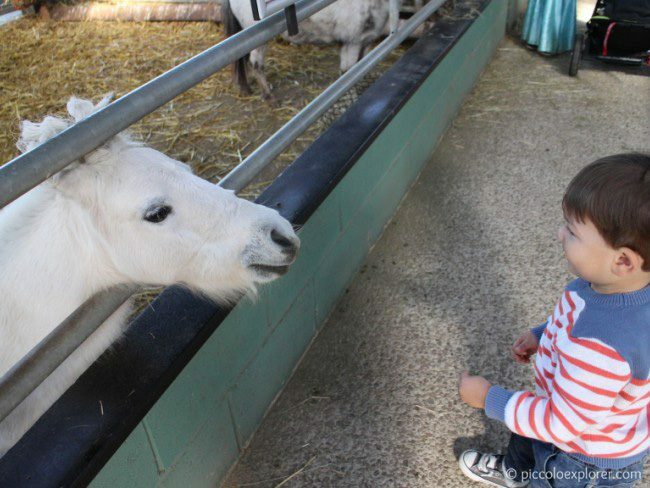 The highlight for Little T was certainly the opportunity to interact with and feed the friendly animals. 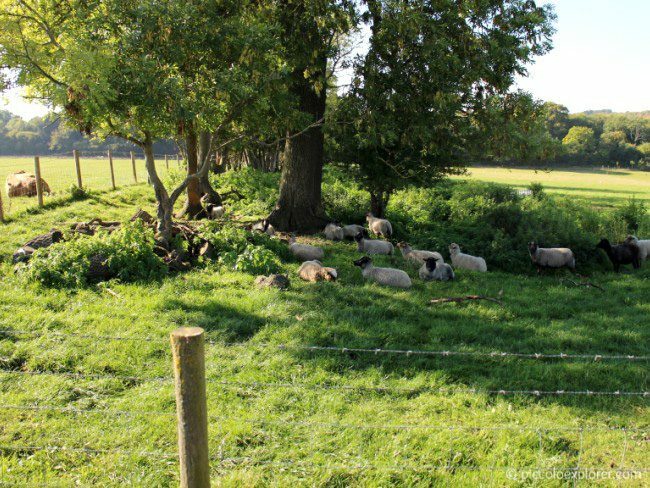 The farm has two good options for food with the on-site cafe and Old Tea Rooms outside. 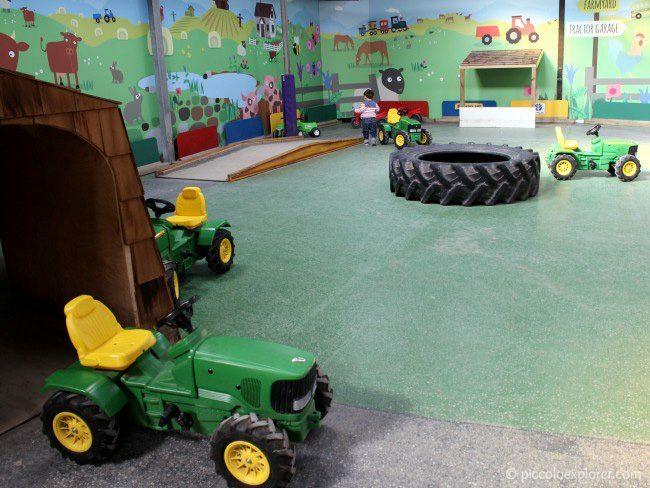 The indoor barn with the play area is heated during colder months and, in addition to the activities I mentioned above, there are pony rides for children over 3 years, a large outdoor playground with climbing frames, a sand pit and a maze and pedal go-kart tracks. 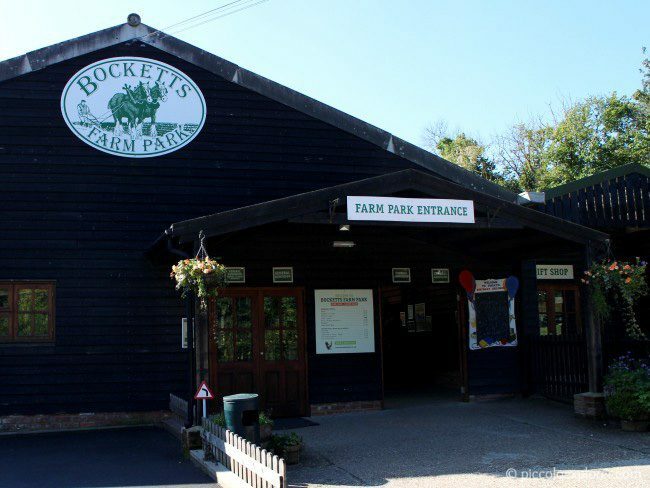 Bocketts Farm Park also run seasonal events, such as Witches and Wizards Week coming up during Half Term – 24th October to 1st November – which will feature a quiz trail, creepy craft corner, hundreds of pumpkins and a reptile road show. Opening Hours: Open 1000 – 1730, except on 25 & 26 December and 1 January. Tickets: Adult tickets are £9.30, children 3 – 17 years are £9.95, children 2 years are £8.20 and children under 2 years go free. 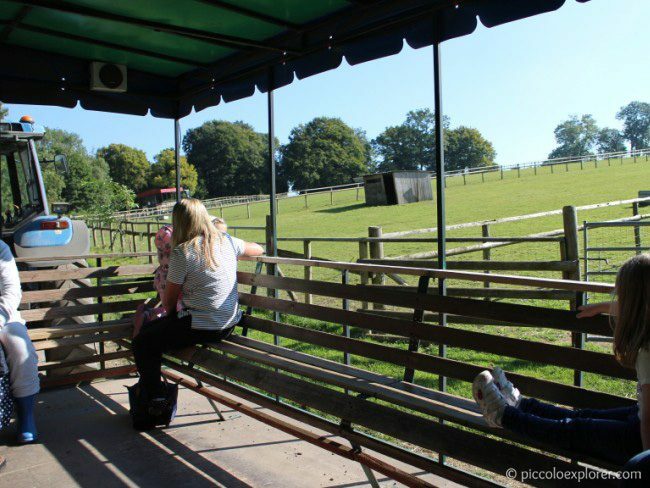 There is an after school rate of £4.60 for visits after 3pm on term time weekdays only. Parking and car admission: External parking is free. There are two large parking lots in front of the entrance. 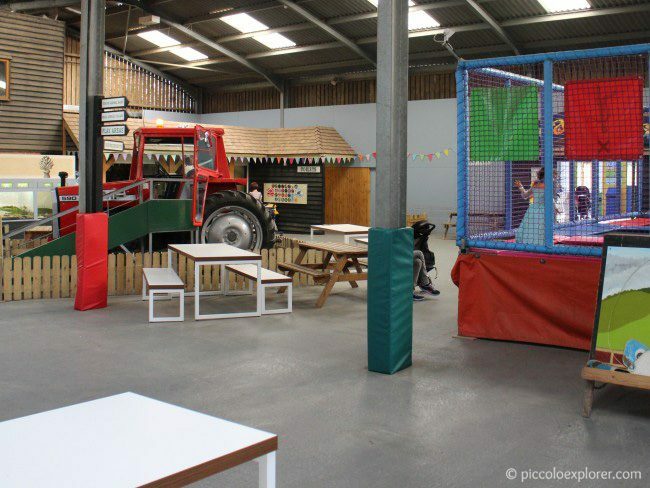 There are two places to eat at the farm: the Cow Shed Coffee Bar (shown in the post above and located by the indoor play area) sells sandwiches, salads, hot and cold drinks, snacks and pastries. The Old Bar Tearoom is outside across from the main entrance and offers a menu of homemade food for both children and adults. 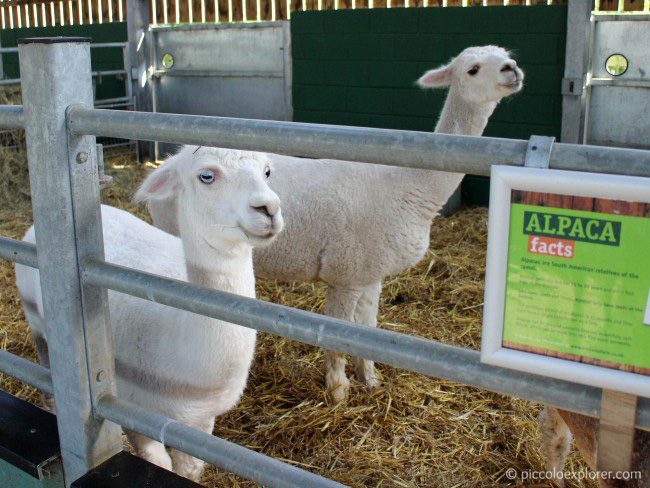 There are plenty of hand wash stations with warm water, antibacterial soap and hand towels, all located close to each animal contact area. 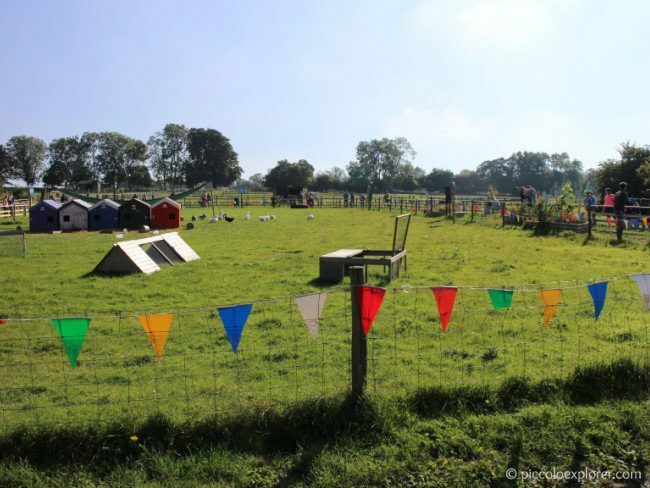 Several baby change areas are available around the farm. 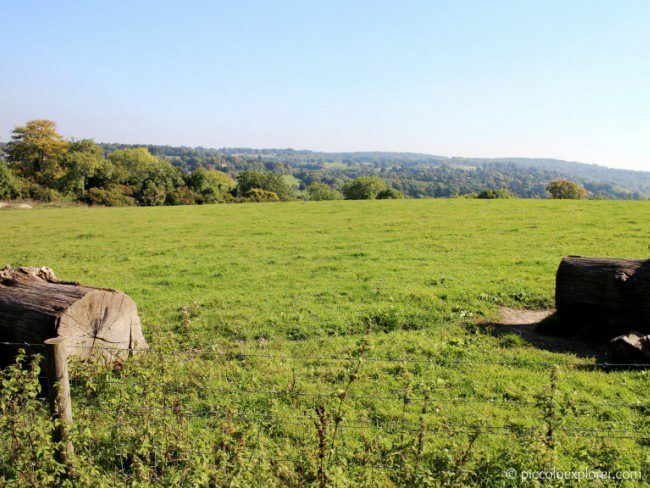 If you require a private area for breastfeeding, let a member of staff know to direct you to the enclosed first aid room. Microwaves are available for visitors’ use in the Tearooms and Coffee Shop. There’s a gift shop on the way out and it’s well stocked with plush toys, traditional wooden toys, books and puzzles, pocket money toys, games and greeting cards and more.